Iron grids may be durable, though they don't last as long as stainless steel. The inherent rusting and tendency for food to stick means spending more time keeping iron grids clean and rust free. Moreover, you must clean an iron grid while it's hot. Experienced grillers know how that can work out. 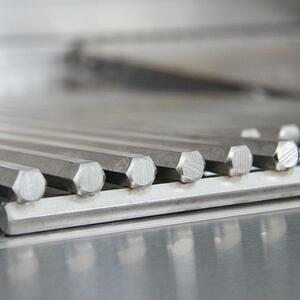 Stainless steel grids involve less maintenance and almost no clean up. The burners are the engine of your grill. Taking a chance on the brittle iron-based burners makes little sense for the serious cook. Burners must withstand tremendous temperature fluctuations. This means that for optimal performance and longevity burners need a solid grade of stainless steel. Most of the best burners consist of 304 stainless steel. Other inside grill components may experience even more heat than the burners. These components include flame tamers, inner hood liners, lower baffles, and burner separators. They will likely consist of 443 or a similar grade of stainless steel. The 443 grade contains titanium and chromium. The titanium acts as a stiffening agent, which holds up like a champ under extreme temp fluctuations. In fact, under such conditions, the 443 holds up even better than 304 stainless. The stiffest possible steel protects your grill's inside components from warping. 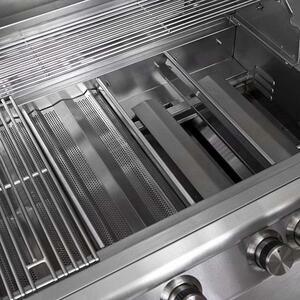 Consider this: a 4-burner grill may have upwards of circa 60,000 BTUs acting on it's inner components. A lower quality metal will not hold up under those conditions. Being exposed to the elements, and heat from inside your grill, means stainless steel is also best for outer walls. Most top-of-the-line grills use 304 steel - known as the workhorse grade - for outer walls because it's highly resistant to corrosion. Using anything other than high-grade stainless for a grill's outer walls is inviting trouble. While non-stainless grill walls may result in a cheaper grill, you're likely to pay for it in the long run when it just doesn't hold up. You don't have to be an expert in steel grades to find a quality grill. However, it is good to have a basic understanding of the strengths of the primary stainless grades. Grills made of primarily iron-based, non-stainless materials are not going to cut it for the serious cook...just go with the stainless.